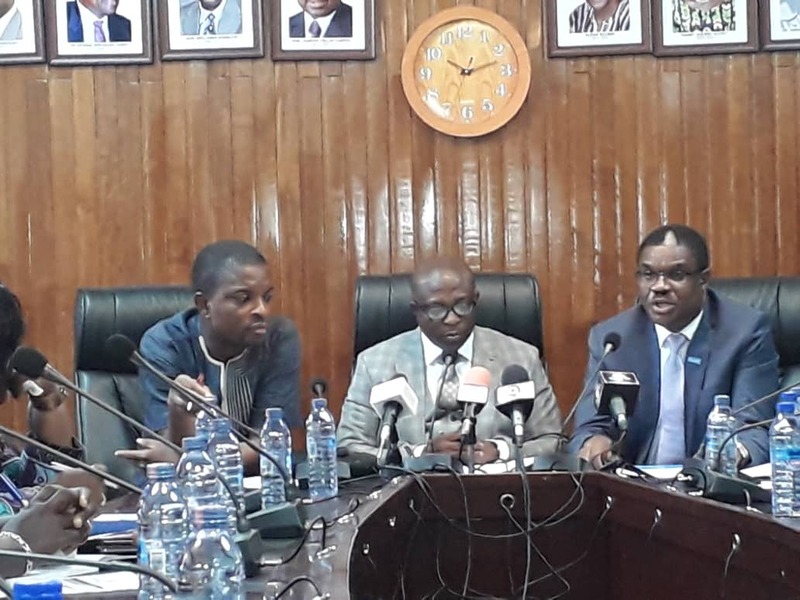 The Ministry of Health in collaboration with the WHO Country Office organized a Press Briefing at the Ministry of Health conference room to mark the World Health Day on 08 April 2019 and under the theme “Universal Health Coverage, everyone, everywhere” and the slogan of “Health for All”. The occasion was an opportunity to increase awareness and understanding about Universal Health Coverage (UHC) as well as the objectives of the World Health Day commemoration among Partners, Stakeholders in Health and the Media . In attendance was the Deputy Minister of Health, Honourable Alexander K.K. Abban who represented the Minister of Health, Mr Kwaku Agyeman Manu, the Country Representative of WHO, Dr Owen Kaluwa, traditional leaders, Directors from MOH, GHS and WCO staff, representatives from Religious Institutions, Civil Society Organizations among others. In a message read on his behalf by the Deputy Minister of Health Hon Alexander Abban, the Minister of Health, Mr Kwaku Agyeman-Manu mentioned that this year marked a very critical year in the calendar for Universal Health Coverage (UHC) and in that regard, there will be the launch of the Global Action Plan for Healthy Lives and Well-Being which H.E President Nana Addo Dankwah Akuffo-Addo mooted the idea and the UN High Level Meeting. He emphasized that the UN High Level Meeting is a major opportunity to mobilize the highest political support for UHC as the cornerstone to achieving SDG3. The Minster of Health again reiterated that UHC unites other health agenda under a common theme. Achieving UHC, he said, was essential for inclusive development, prosperity, and fairness and requires political decisions that go beyond the health sector. “UHC is a key to reduce poverty, promote equity and social cohesion. A strong system for monitoring and evaluation is needed to ensure accountability and participation” he added. Mr Agyeman Manu indicated that as Ghana had began the process of developing a UHC Roadmap for the country and this will be part of our conversation at this year’s Health Summit which will be held on the 15th and 16th of April,2019. Mr Agyeman-Manu again took the opportunity to congratulate and appreciate the WHO for the support given to the health sector over the years. “It is our hope that the Institution will grow from strength to strength to help improve the health status of people” he concluded. He further reiterated that UHC enabled everyone to access the services that address the most important causes of disease and death, and ensured that the quality of those services was good enough to improve the health of people who received them. “This is the vision that we should all commit to and WHO in the African Region is committed to supporting Member States to achieve UHC” he said. Dr Kaluwa concluded by commending the Government of Ghana for strengthening primary health care through the Community Health Planning and Services (CHPS) concept and called on Government, partners and all stakeholders to continue to support CHPS and make them functional so that their full potential of improving health and wellbeing is realized. In his presentation, the President of the Ghana Coalition of NGOs in Health, Dr Gabriel Benarkuu recommended that there was a strong need for the state (MOH) to co-develop “Community Partnership Model” and not just participation in health delivery. He also mentioned that it was important to mobilize energies and resources and best practices from the WHO to ensure Primary Health Care Financing was sustainable for the attainment of agenda 2030. He said Ghana should use the World Health Day commemoration to enhance partnership with Communities, CSOs and Development Agencies. Journalists present interacted with the speakers at the function as well as senior officials from the Ministry of Health and its Agencies through the Question and Answer Session which turned out to be very informative.